I've always enjoyed taking pictures, but I wouldn't argue I'm particularly good at taking them. Throughout college I had a couple of roommates that had very fancy cameras who would spend hours out in Evanston, IL between practices taking hundreds of photos and testing out how there new 35mm lens worked. For whatever reason I never got into it then, but after having been on the road for nine weeks and spending a lot of time looking for "that one" Instagram photo that would boost my follower numbers exponentially, I realized that I actually really do like photography. The nice thing, though, is that nowadays, you don't have to spend a fortune on a great camera to take a REALLY GOOD photo. Sure, I can take a much better photo by investing in an expensive camera, but that can wait until I return from my trip. Outside of the iPhone 6 (which I love and use for all my pictures), there are numerous different phones out there that can provide you with a really terrific photo. Though the iPhone 6 isn't the top rated camera phone out there, I found that with the right light, a good editing app (Snapseed is a personal favorite of mine), a keen eye and attention to detail, and a little bit of research on how to take a "good photo" as described by the experts, just about anyone can take an excellent shot. So, after returning from the road, I figured a fun post would be to feature my ten best (in my opinion) pictures from my road trip across the U.S. Several of these you may have seen elsewhere on John Sees Earth and some of them you may recognize from Instagram (though my biggest peeve with them is that it forces you into a square photo unless you use an app to get around it). You'll notice I have a heavy bias on the west coast which is really for two reasons. Reason 1 is that I acquired an iPhone 6 halfway through my trip, so my photo quality and pixelation went up dramatically from my 4S. Reason 2 is that I found the west coast to be much more breathtaking and photogenic than the east coast. Nonetheless, here are my ten favorites. Though I didn't take this picture during my actual road trip, it did still fall within the North America, iPhone, and post work-life categories so I decided to throw it in. Designated as the gateway to the west, the Arch is one of the most iconic and well photographed monuments in North America. From the angle this picture was taken at (which I'm sure is not all that uncommon) you can see the massiveness of the Arch from below and get a sense of exactly how impressive this structure is. A short, claustrophobic ride to the top also will give you impressive views of west St. Louis (and east, but it's far less...photogenic). I took this picture in April 2015 following a wedding for some college friends. All-in-all, I enjoyed St. Louis. It's social, active, seemingly young, and very into sports, and there is no lack for bars and clubs down around the Arch and St. Louis Cardinal's stadium. I'd only ever heard rumors about how scenic Vermont was, but after seeing it first hand, the literal French translation of the name finally makes sense to me (Verd Mont or Green Mountain). This state is certainly not lacking in greenness or in mountains, though their definition of mountain is definitely a bit different than the west coast, I think. I took this picture during a hike in the southern part of the Vermount, about 15 miles east of Bennington off of Highway 9 (a particularly scenic drive through the middle of the mountains on its own). It gives a nice perspective of the treetops above, still not completely full of leaves due to it being taken in early May. This picture was actually taken from a rooftop bar in Brooklyn, but the Manhattan skyline is visible in the distance silhouetted by the May sunset. I liked this picture because NYC is so often associated with its lights and activity, but from this angle it as though Manhattan is dark, lighted by just the sunset and single lightbulb. Before my trip I had only visited Manhattan and had somewhat signed off on NYC all together. I'm not a huge fan of busy cities and crowds of people so downtown never appealed to me. After getting out into the other burrows, though, away from Manhattan, I have a much different perspective on what it's like to live in NYC than I used to. Possibly one of the most underrated destinations in America, the Grand Tetons sit just south of Yellowstone National Park (beautiful, but overrated in my opinion. See below). If you're coming in from the south, you'll pass through Jackson Hole, WY, just minutes from views like this. This picture was taken within the park at Jackson Lake, though you do not have to go into the park to see the Grand Tetons. Quite possibly one of the most photographed mountain ranges in America, the Grand Tetons do not disappoint, and you will spend most of the drive correcting the direction of your steering wheel due to lack of attention to the road. You're right, this is not Old Faithful. Nonetheless, Yellowstone provides hundreds of geysers you can see erupting, and though this particular one is not, it still feels like you're on a different planet. Due to bacteria that has thrived in this alien location, the geysers each have their own mixture of colors depending on the temperature and depth of the water within. I can't remember the name of this particular geyser, but it really doesn't matter as the entire area of the park around Old Faithful looks just like this, holes into a deep abyss surrounded by steam and bacteria as if on a different world. Overall, though, my impression of Yellowstone was that it's overrated (as stated above). I felt there were much better spots in the Western U.S. to see and spend time at unless you're looking for a tourist trap of people who can't drive. The entire town of Hope, AK could have it's own photo shoot, but this one of my favorites. We only stayed in Hope one night, but the campsite and the views we had were enough to let me classify it as one of my favorite spots. Hope, a small town nestled south of Anchorage down a very remote road, had one of the most amazing campsites I've ever seen, right along the water, banked on three sides by mountains. This particular picture was taken at the top of a morning hike up Point Hope and looks down on the low-tide Turnagain Arm below. 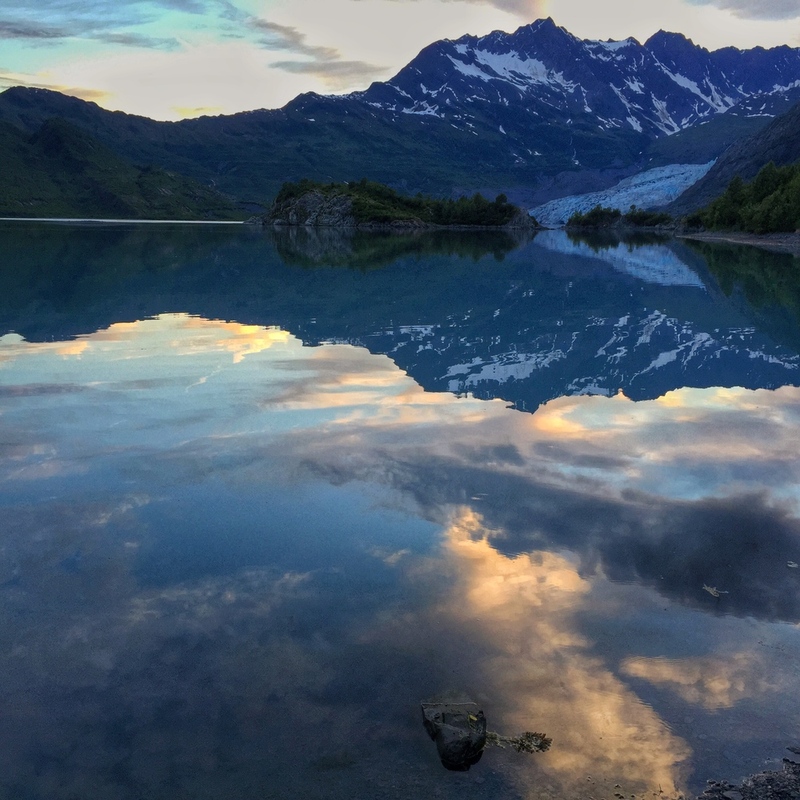 This picture was taken at the end of a hike, as well, looking south to the other side of the Kenai Peninsula across the Kachemak Bay. Like Hope, Homer could have it's own album on here. A fishing village originally, Homer has grown to a fairly modest size (for Alaska standards), and now is a large area for halibut fishing charters and the arts. It had great coffee shops and, though it was cloudy, great views of the mountains (like everywhere in Alaska). This panoramic had a really nice contrast between the sky and the water providing for some really neat images. The sun was also peeking through a bit in the mountains, making them shine a bit more than everything else around. I had fun with this one on my Instagram, but here's the original. Our cabin and campsite were setup across the bay from the Shoup Glacier, one of the coolest things I've witnessed to this point. The first night we were there provided an awesome sunset and calm water, allowing for some spectacular reflections and photo opportunities. It's hard to tell which way is up without the rocks in the bottom of the frame. Shoup Bay and the glacier within it were likely the most breathtaking things I saw during my entire road trip. Glaciers are far-and-away my favorite geologic formation, so seeing one up close and getting to camp next to one were certainly bucket list items I didn't even know I had, but can now check off my list. My favorite photo from my trip, this was an image I saw over and over again for three days at Shoup Bay. I have little to say about it aside from WOW! My favorite place in the entire world, Burt Lake, MI never ceases to amaze me. I've been coming here since I was four and every sunset is impressive. This was actually the last picture I took on my road trip, as I finished it off at Burt Lake. What an impressive way to end. I hope you enjoyed some of my favorite photos. There are plenty more that I'll put up at a later date on here so keep an eye out on the Photography page of John Sees Earth for more.